Independent adjustments for compression and rotation. Can be attached to any endo-skeletal system that uses a 30mm tube. Total Shock reduces both rotary forces on the knee joint and shear forces on the residual limb. Amputees using Total Shock will therefore discover greater comfort during activities for daily living, such as walking down stairs or negotiating curbs, traversing uneven terrain, playing golf or jogging. Ceterus featuring built-in shock absorption and rotation. The design permits the TruStep to respond to ground reaction forces providing the user freedom of motion in all three anatomical planes. 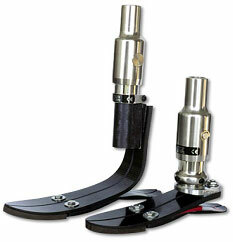 The TruStep mimics natural foot/ankle function and reduces the shock that occurs with every step. This results in a more symmetrical gait and a reduction in energy expenditure for the user. Vertical motion, rotation and stability found in the anatomical foot are functions built into the TruStep. Each TruStep Foot is backed by the BEST Warranty in the business! 3 years for patients weighing up to 100 kg (220 lb.). 18 months for patients weighing 100 to 160 kg (220 to 352 lb.). Our bumpers are replaced FREE OF CHARGE during your warranty period as well.